In an earlier post I spoke about my gargantuan basil garden and how I’m a little overwhelmed by the abundance of it. Now, it didn’t begin as a “basil garden” per se; it’s just become one because it bullied out the other herbs growing there. As a result, I’m still here with copious amount of the green herb. Now I’m mulling over what to do with it, and the obvious answer is: freeze some for later! 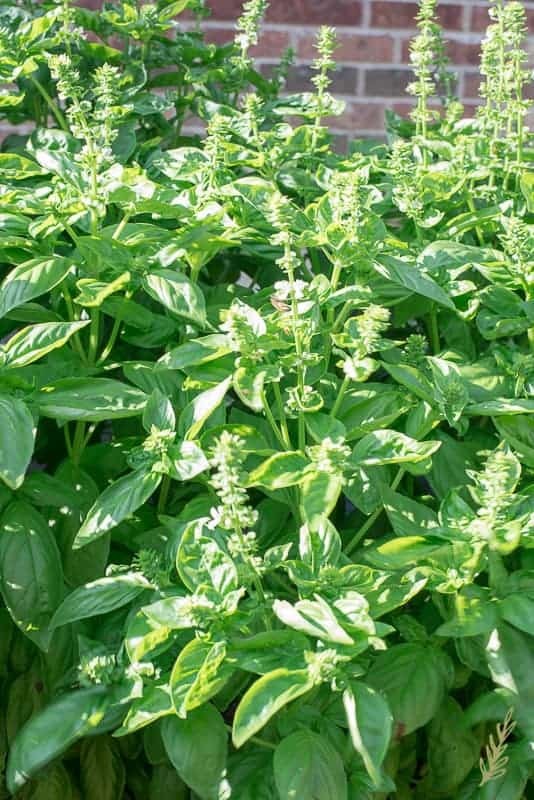 This post is going to teach you a need-to-know technique when dealing with herbs- especially basil leaves. How to Chiffonade Herbs is vital knowledge. Right up there with how to properly apply false lashes (which I don’t know how to do- but whatevs). Mainly for aesthetic reasons. It just looks pretty. There’s no “taste” reason to do it. 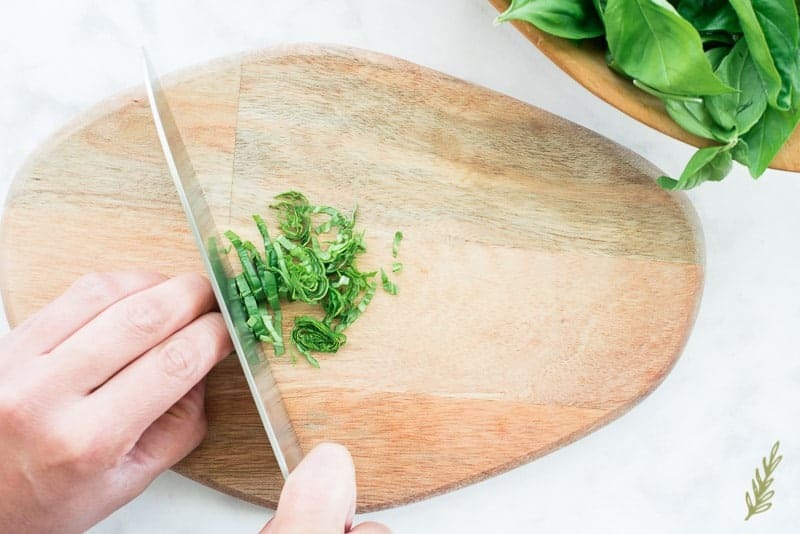 Herbs that are cut this way are usually those that will be topping something else, so you want them to have a nice appearance. I, sometimes, use this method when I’m going to mince my herbs because it ensures uniformity. You can say that’s another reason to chiffonade. But, again, the primary reason is because it looks great. Chiffonade is obviously a French word- it means to cut into thin ribbons. That is precisely what you’re doing when you chiffonade anything. 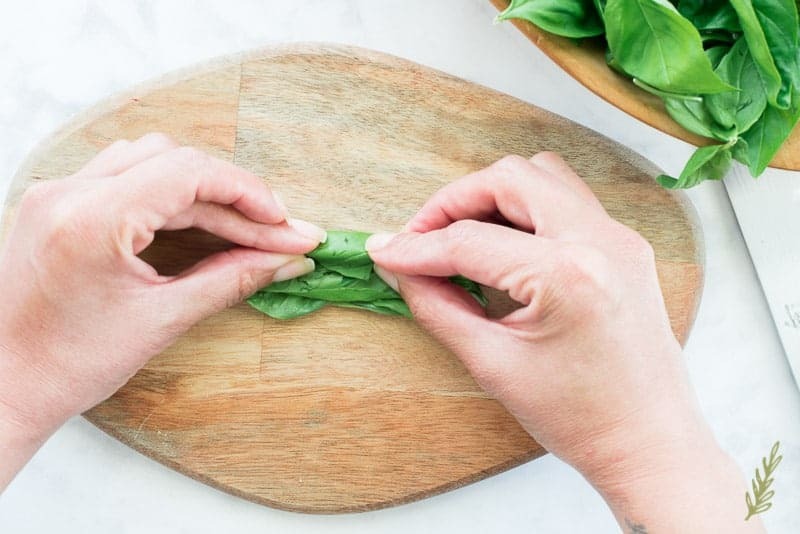 Be it basil, spinach, chard…as long as you are using this technique, you are chiffonading. The first step in pulling this off is to remove anything you don’t want to chiffonade from the leaf. 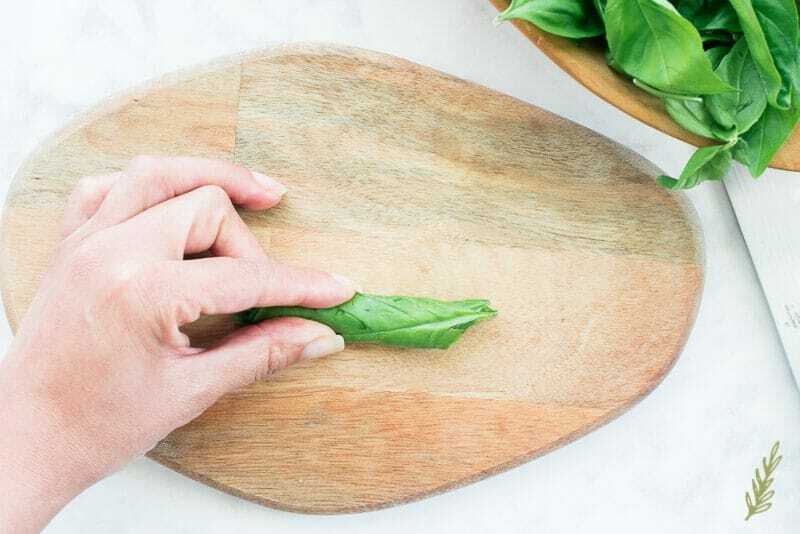 If you are working with spinach or basil, like I am here, remove the tender stem. While these leaves have softer stems than, say, chard or kale, they are bitter, so you don’t want them included in your recipes. For those leaves with tough, woody stems- kale, chard, etc.- remove them because they’re a hassle and you don’t want to cut through them; let alone eat them. How do you chiffonade herbs? To roll up the pile of leaves into a tight…well, um…a cigar-like package. No further comments. Make sure your bundle of basil is tight when you roll it. This will ensure you have even ribbons after you’ve cut. If you have a loose bundle or it’s not rolled properly, your ribbons will be thicker in some areas and thinner in others. Obviously, no one’s going to grade you on your performance, but if we’re learning to do a technique, we’re going to learn to do it right, right? Right! 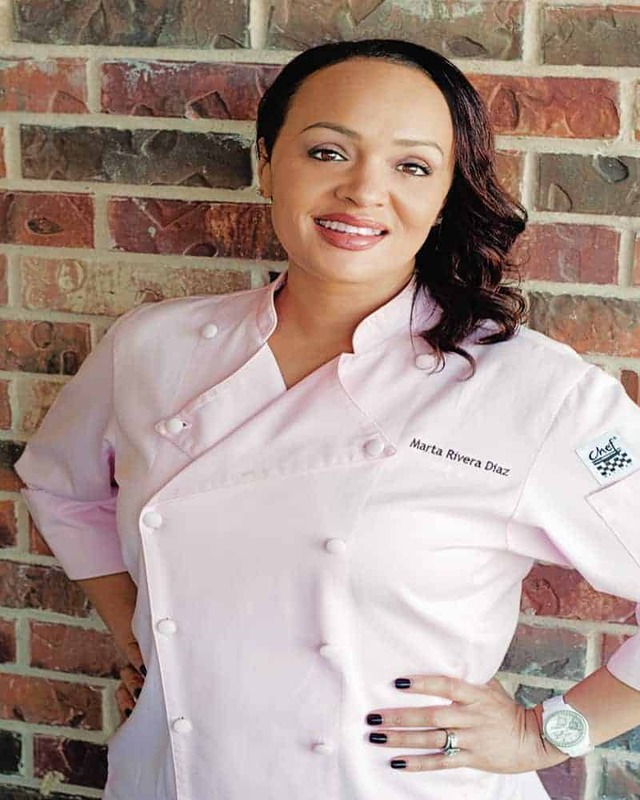 Now that your bundle is rolled tightly, grab your chef’s knife with your dominant hand. Basil bundle is in your opposite hand, held down by your fingers (which are curled under for safety). 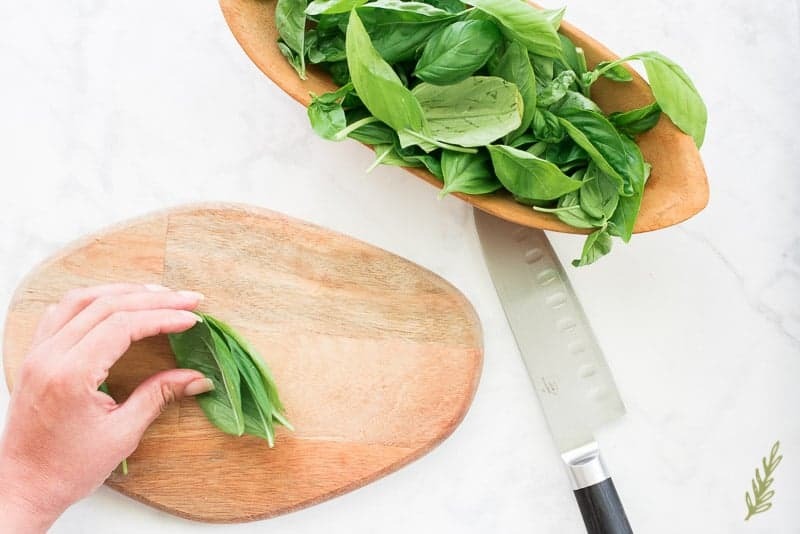 Run the blade of your knife through the bundle of basil starting at the tip of the bundle. Work your way through the roll in eight of an inch slices. This, when complete will leave you with green ribbons of herbs. 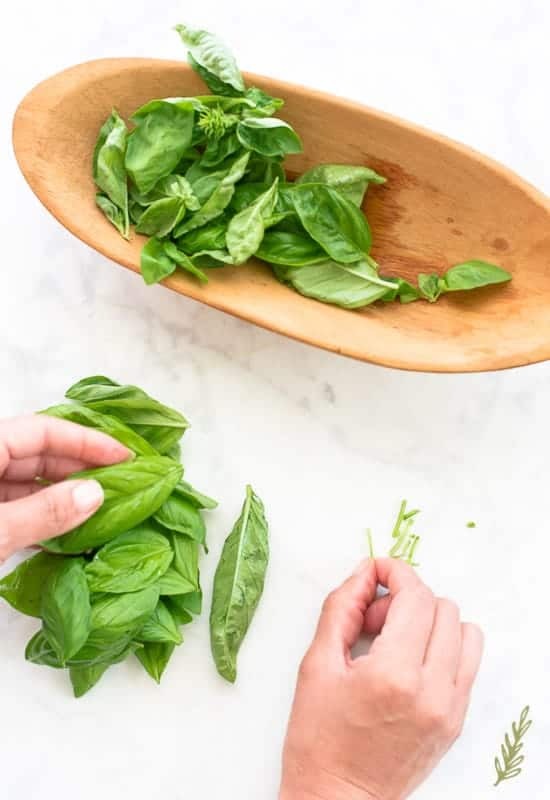 From here you can pack the chiffonade basil into ice cube trays and freeze them for stirring into sauces or other recipes at later date. You can also use it fresh on recipes like this Chèvre and Tomato Tart. So, here’s one more technique to wow your friends and family with. Pin it so you can practice later, then share it with your herb-loving friends! Thank you for the education. I have never heard of chiffonade herbs before. It’s my pleasure, Cristy! I hope it comes in handy one day. This is all so new to me! Thank you for sharing this! I love all the unique ways we can use herbs. Me too! 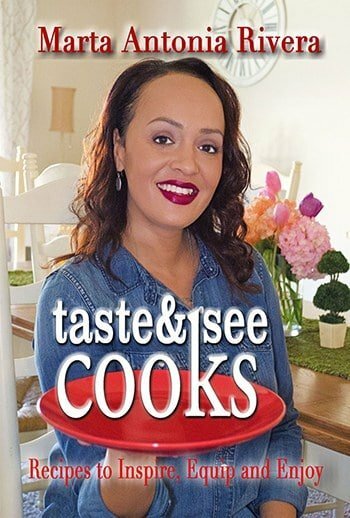 They’re such versatile ingredients, aren’t they, Nicole? This is a great tutorial. 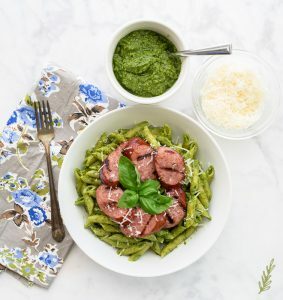 I love using chiffonade herbs for garnishing dishes. My favorite use is bruschetta. Yes, Leslie!! As a matter of fact, I need to make some bruschetta now! You live you learn. I had never heard of this term or what it means even though I do chop my leaves this way sometimes. Well there you go! You now know what it is called, Tanvi! OMG this is perfect timing! My basil is starting to grow out of control and I didn’t know what to do with all of it! This is a great way to take care of that basil, Sam! If it’s on the plate it should be 100% edible, Theresa. I’m not a fan of chefs or cooks who put inedible things on their plates. I’ve never seen this before! Very interesting! This was such an interesting post. I have never really thought about eating the herbs but yes they are definitely amazing. Thanks, Becca! I want everything I use to be edible. This just makes it pretty and edible at the same time. My Mil shared this same thing with me a few months ago. Total game changer. So good!! Indeed, Angela! This ups your kitchen game a few levels! Oh! This is so good to know! 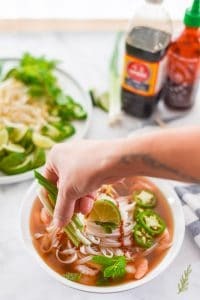 I will have to try this next time I cook! I love herbs. These are new to me though. Great use . Can’t wait to try them. I think you’ll enjoy it, Aditi! I’ve always thought it was amazing how many people don’t use fresh herbs in the kitchen. The flavor is amazing. Great tutorial! I think so too, Lecy! I prefer fresh herbs over dry any chance I can get my hands on them. It’s my first time to hear about chiffonade; this is an interesting post. I usually don’t eat the herbs, though! Every time a food is served and I see those herbs or flowers, I always wonder if I can eat it or not. Good thing, my boyfriend knows about it and he said it’s not just a decoration, but I could also eat it. Haha. Yes, Karen! Eat and enjoy those herbs! Funny I just did a recipe the other day and I had to google what chiffonade meant! Good post! Awesome! I wish I would’ve put it out sooner, Candice! I never would have known this! Thanks for sharing!